Though I’ve previously covered How to install WordPress in Windows Vista, that method used a BitNami stack, which comes with a few drawbacks. The method outlined in this tutorial will leave you with a perfect WordPress installation on your PC – which is great to use as a development and testing environment. Before you install WordPress, make sure you have WAMP (Windows, Apache, MySQL & PHP) installed. Fortunately we have a tutorial that walks you through each step of installing and configuring WAMP. Once you’ve got that done, continue with step #2. Click the WAMP icon in your System Tray and select www directory. Explorer will open the folder C:\wamp\www\. This is where your HTML, PHP and other site files reside. You’ll notice an index.php file. This a WAMP file (the one that provides shortcuts to phpMyAdmin etc). You don’t want to delete it, but you also probably don’t want to leave it titled index.php. Rename it to something else (for example, wamp.php). When you extract WordPress, it will create a folder called wordpress. If you’re using WAMP specifically for WordPress development, and you don’t want to have your blog show up at the address http://localhost/wamp (and would rather it display at http://localhost) – select all the files in the wordpress folder, cut and paste them into the C:\wamp\www\ folder. Now load the WAMP config screen in your browser by entering the address http://localhost/wamp.php – assuming you renamed the WAMP config file to wamp.php (in step #4). In the Tools section, select phpmyadmin. To create a new database for WordPress, select the Databases link. In the Create new database section, enter wordpress as the database name (or something similarly descriptive) and click Create. Make sure you get a confirmation that the database was successfully created. Now enter http://localhost/ into your browser. You’ll be greeted with the WordPress “getting started” screen. Click the Create a Configuration File button. Review the info, and then click the Let’s Go! button. In the Database Name field, enter wordpress (or whatever database name you specified back in step #11). Enter root as the User Name (unless you’ve created another MySQL user) and your MySQL password in the Password field. Your Database Host should be set to localhost and the Table Prefix should remain wp_ (but can be changed if you wish). When you’re done, click Submit. Now click Run the install. A few seconds later you’ll be presented with the Information needed screen. Give your blog a title, and enter your email address in the provided fields. If you’re using this WordPress installation as a development site, uncheck the Allow my blog to appear in search engines like Google and Technorati. Click Install WordPress. Make note of your username (admin) and assigned password, then click the Log In button. Enter your Username and Password in the appropriate fields, and once again click Log In. That’s it! You can start writing posts, uploading/creating themes etc. Thanks for an excellent in depth tutorial. Unfortunately I can’t quite complete it. I’ve successfully installed WAMP and on installing WordPress I’ve stopped on item 7. I have done exactly as instructed but get the message, NOT FOUND The requested URL /wamp.php was not found on this server. However I moved on and stumbled on item 13 and get the message, There doesn’t seem to be a wp-config.php file. I can’t get any further and would appreciate any advice you can offer please. Do you have any ideas what’s up with that? ciao, è possibile poter copiare interamente il proprio blog online su questa piattaforma? Merci infiniment. Un tuto super. Toutefois, il est bon de préciser qu’il vaut mieux installer Wamp 2.0.c, sans quoi on risque de se trouver face à une incompatibilité, qui demande ensuite à bidouiller. Une perte de temps, car ça marche nickel avec la version c au lieu de la dernière, qui doit être la d.
I looking this tutorial, thanks for making it. For all those people stuck with the “Waiting for localhost” issue.. I found a workaround for myself after running into this same issue. It was pretty easy, thanks for the tutorial and for the easy simple steps. It worked like a charm! Questions for you.. 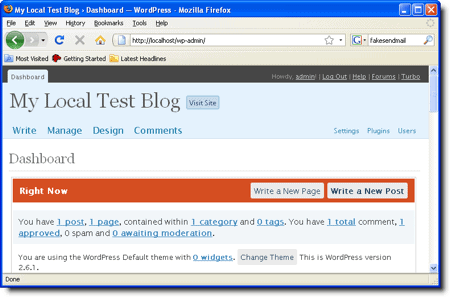 I am not using WP to create the entire site, just as an add on to manage the blog and content. This site is still in development on my computer in a folder on my NAS. Do I need to copy the folder to C:/wamp/www/ ? Thanks for your help, this is a very good tutorial. i already have a blog, i did all that and it made me create a new blog when i wanted to install plugins in my current wordpress blog. THANKS A LOT, U GUYS ARE SO KIND……. June 2013: These instructions worked great for installing Wordpress through Wamp (while also having Drupal installed through Wamp)…Thanks.